Some years ago, we almost simultaneously came across two works, unknown even in the piano duo world and dealing with Johann Sebastian Bach each in an entirely different way: first, the Contrapuntal Studies by Ignaz Moscheles, in which he composed a concertizing second piano to 10 Preludes of the â€žWell-Tempered Clavierâ€œ, and second, Robert Schumann's Six Fugues on the name BACH for Pedal piano. This colossus, which can be heard in our time only on the organ every now and then, seemed to long for an alternative piano shape, which we now present to the public with our four-hands-transcription. 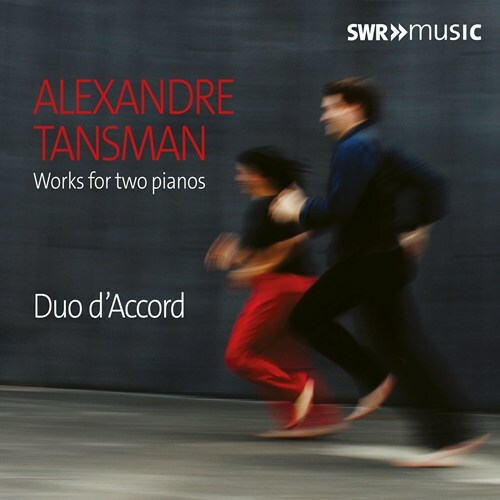 Both cycles fascinated us enormously, in their individual mastership as well as through the total contrast of their nature: Moscheles absolutely free and playful, Schumann, on the other hand, writing in the strict style and longing for contrapuntal perfection. To complete the album, we decided to choose a work right in the middle between these extremes: Carl Reineckes Bach Variations for piano four hands. The initial point here is Bachs Sarabande from the 1st French Suite, whose dark oscillation must have put Reinecke evidently under its spell. 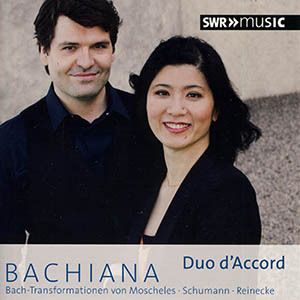 In order to present this multitude of Bach transformations, with their friction between the baroque and romantic era, in an intriguing way, we have dramaturgically structured the CD. Thus, two Moscheles Preludes and one Schumann Fugue form an unity - this formation experiences many atmospheric conversions as the album goes along and, finally, leads to the triumph of the the last fugue's finale. After that, Bach's original Sarabande starts the last track, with Reinecke's expressive variations and a surprisingly contemplative ending. We hope you enjoy listening and discovering! 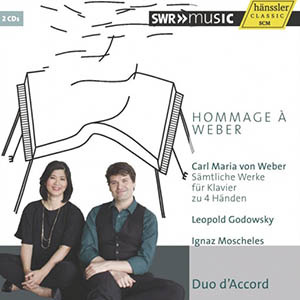 Lucia Huang and Sebastian Euler are to be thanked for this Weber initiative in every way! 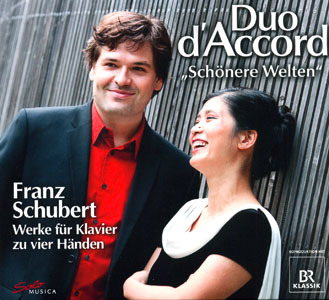 We need to be thankful for a team like Duo d'Accord for overcoming all the difficulties and giving us one of the greatest Schubert releases ever. 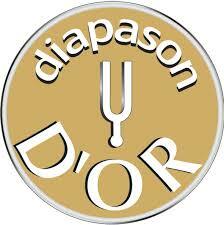 Their ensemble is razor-sharp, their sound always perfectly balanced, and their conception grand and expressive. 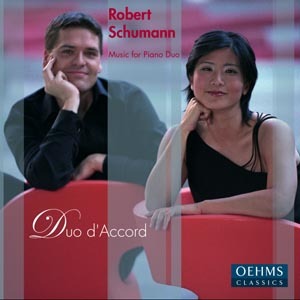 Lucia Huang and Sebastian Euler demonstrate sparkling vigour and an art of differentiation which enables them to convey the very depths of Schumannâ€™s emotions. Schumann deserves nothing less than these brilliant interpreters of his works. This album not only offers a very special kind of performance but also amounts to a rehabilitation of Regerâ€™s piano music. The music retains its lightness, its mischievious humour and â€“ something largely unassociated with Reger â€“ its casual conversational rhythm. 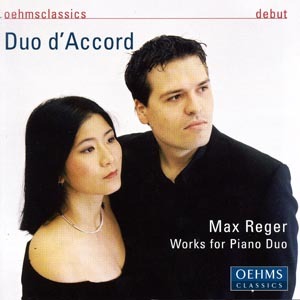 Compared with other performances of Reger, the pianistsâ€™ great sensitivity to tone and integration of surprising effects render this a much friendlier interpretation to the ear. 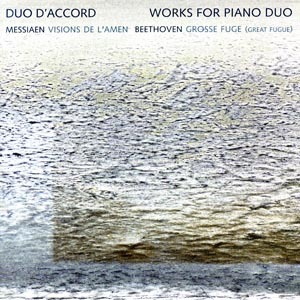 With this, their debut album in the world of classical music, Duo dâ€™Accord immeditately moves into the upper strata of performers of piano music for four hands.